Inayat Moosa, MPAS, PA-C, joined Desert Orthopedic Center in 2015. He works with Dr. Reginald Fayssoux in all aspects of patient care, including seeing patients in the office and assisting in surgery. A native of Pennsylvania, he has been a PA since 2003 and spent the first 5 1/2 years of his career working in Orthopedic Spine Surgery and the past 5 1/2 years in Total Joint Surgery before making his move to California. 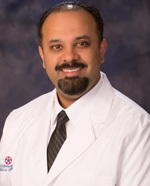 Inayat received his bachelor's degree in Biology from The Pennsylvania State University and his Master's degree in Physician Assistant Science from St. Francis University. Inayat is a board certified Physician Assistant with memberships to American Academy of Physician Assistants (AAPA) and California Academy of Physician Assistants (CAPA). "It's an honor and privilege to have patients allow me to help them pursue the best quality of life."